To coincide with the BBC Stargazing LIVE event, the University of Southampton is hosting a special astronomical event for all the family in the New Year. 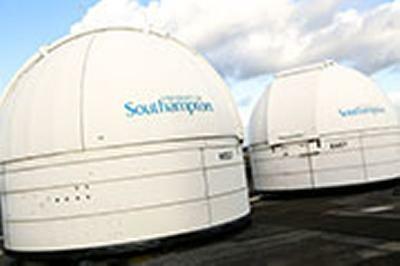 On Wednesday 8 January 2014 from 5.30 to 9pm, members of the public are invited to see the stars either from the comfort of the Soton Astrodome – the University’s inflatable mobile planetarium – or from the rooftop observatories. The Astrodome will be running five Planetarium shows during the evening and there will be a number of tours to view the stars and planets through the roof telescopes, plus there will also be astrophotography talks for both beginners and intermediate photographers and two talks from astronomy lecturers on black holes and Saturn. There are lots of other free activities throughout the evening that do not require tickets. These include hands-on activities from the Astronautics Research Group, who will demonstrate some of the University's research into space debris and spacecraft systems engineering. They’ll have interactive computer games, spacecraft test models, space activity packs and even examples of the damage space debris can do to household objects. Other activities include ‘Ask the Astronomer’ and ‘Astronomy Know How’ stands, plus astrophotography workshops and ‘World Wide Telescope’ tutorials. There will also be inflatable planets and colouring-in activities for young children, plus the Southampton Astronomical Society (SAS) will also be in the foyer with their telescopes.